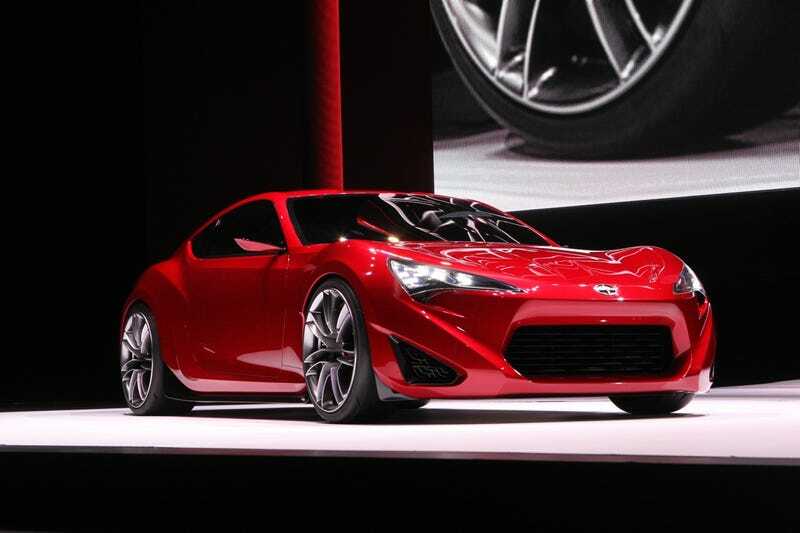 After the most difficult gestation since someone decided "Spiderman" needed to be a musical, the Scion FR-S Concept finally appeared at the New York Auto Show, carrying the hopes for a true compact rear-wheel-drive sports car — actually coated in candy. The latest iteration of the Toyota-Subaru joint venture known as the FT-86 appeared with a body that makes a pledge to uphold Toyota chief Akio Toyoda's pledge to put some passion back into the company's vehicles. Blunt, smooth and compact, yet with the long hood of a proper rear-wheel-drive car, the FR-S should easily be the most handsome Scion ever when a production version appears within a year. Toyota only revealed partial information about the heart of the FR-S, saying it would sport a 2.0-liter boxer engine of unspecified power tweaked with a Toyota direct injection system, paired with six-speed transmissions of either manual or automatic stirring. It's such an attractive car — the kind of sports coupe forgotten in a rush to fuel savings — that we could almost taste it. Apparently it would taste pretty sweet, according to this line from the press release: "The FR-S Concept is layered in rich coats of Code Red, the appropriately named color that consists of a custom blend of candy and a developmental additive from BASF called Mearlite SSQ." Scion. First with cars you want to lick.